Do not doubt My love for you, for it is based on My faithfulness and not on your own. I am the God of all truth, and I do not lie. Indeed, when I tell you something, you can count on it, for I always keep My word. All My promises are yea and amen. Therefore, believe that the blood of My Son has already made atonement for your sins and your shortcomings, and you are no longer separated from My great love for you. Do not allow the enemy of your soul to mire you down in guilt and shame, for My Son has already cleansed you from them. Do not allow the evil one to talk you into disqualifying yourself from the many blessings that I have for you. In you and you in Me, and there is no condemnation to those who are in Christ Jesus. The devil is your enemy, and his desire is to harm you. He is a liar and a thief, and he wants to steal all the good gifts and many blessings that I have ordained for you. He wants to heap false guilt and condemnation on you in their place, but he does not have power over you in these areas unless you give it to him. Therefore, don’t give him the power that I gave to you; resist him and he will flee. My child, this day stop struggling with guilt and condemnation. My love set you free. My love conquered all. No more condemnation. Shake off what the enemy is trying to bring against you. Now, lift your head up and walk on in victory. Let nothing separate us; for I am faithful and true, and I do not change. I will never fail you, and that is why condemnation has no more power over you. 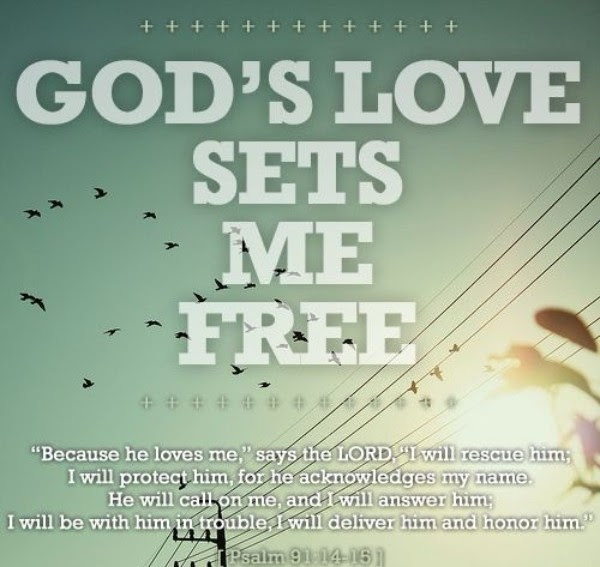 My love has set you free. 2Co 1:20 For all the promises of God in him are yea and in him Amen, unto the glory of God by us. Rom 8:38-39 For I am persuaded, that neither death, nor life, nor angels, nor principalities, nor powers, nor things present, nor things to come, nor height, nor depth, nor any other creature, shall be able to separate us from the love of God, which is in Christ Jesus our Lord. Joh 10:10 The thief cometh not, but for to steal, and to kill, and to destroy: I am come that they might have life and that they might have it more abundantly. Joh 8:36 If the Son, therefore, shall make you free, ye shall be free indeed.